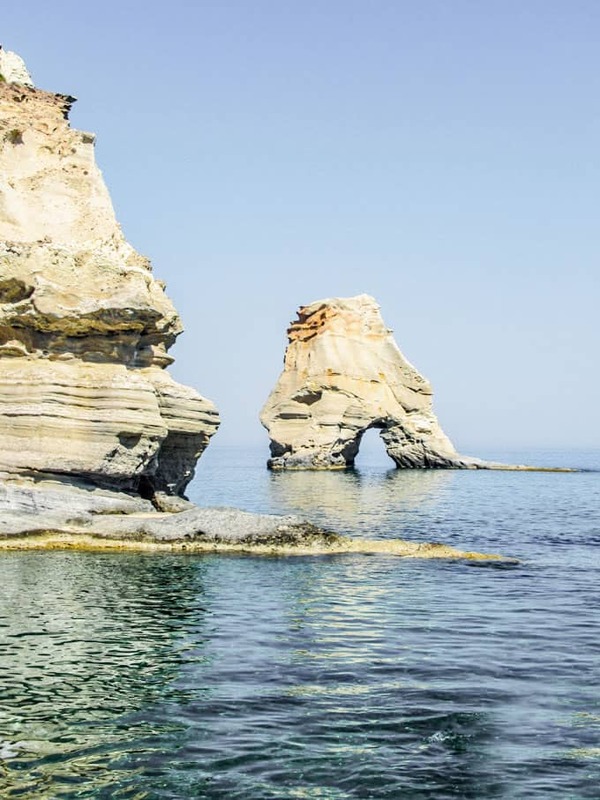 Milos island is one of the up and coming Greek islands located south of Athens and north of Santorini. 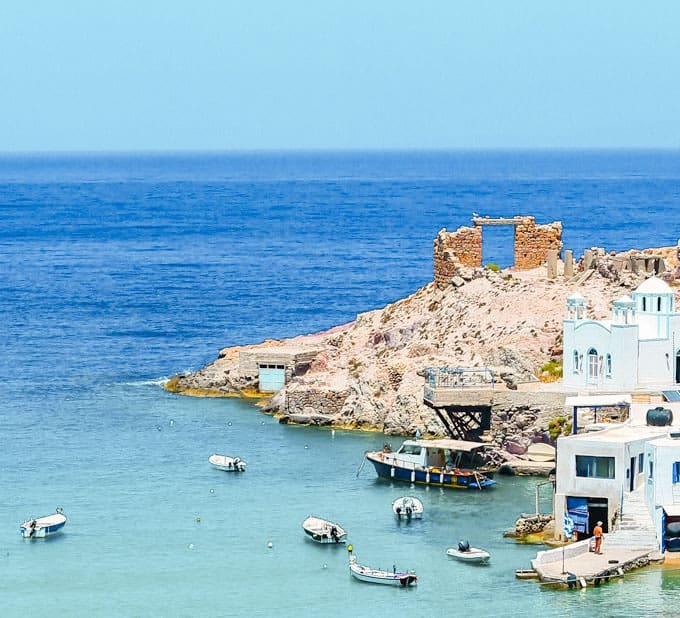 It’s a mere 45 minute flight from Athens or a short (4 hour) ferry ride from Santorini and in the last few years has really gained some traction with tourism and social media. And it’s no wonder why. The island is flowing with over 40 beautiful beaches each unique and spectacular in their way. 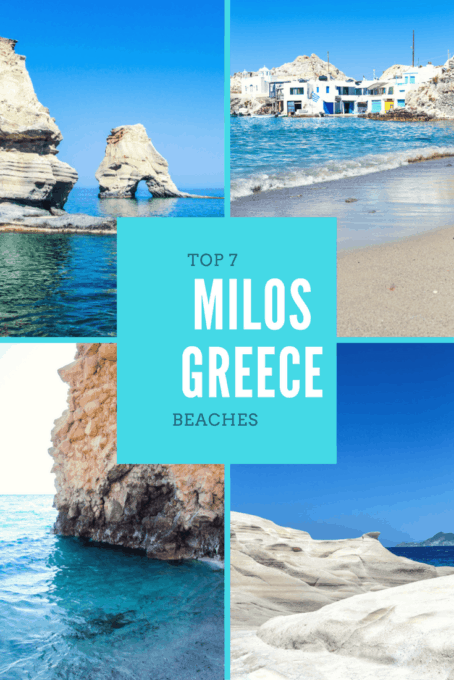 This guide covers the must see beaches in Milos as well as where these beaches are located. 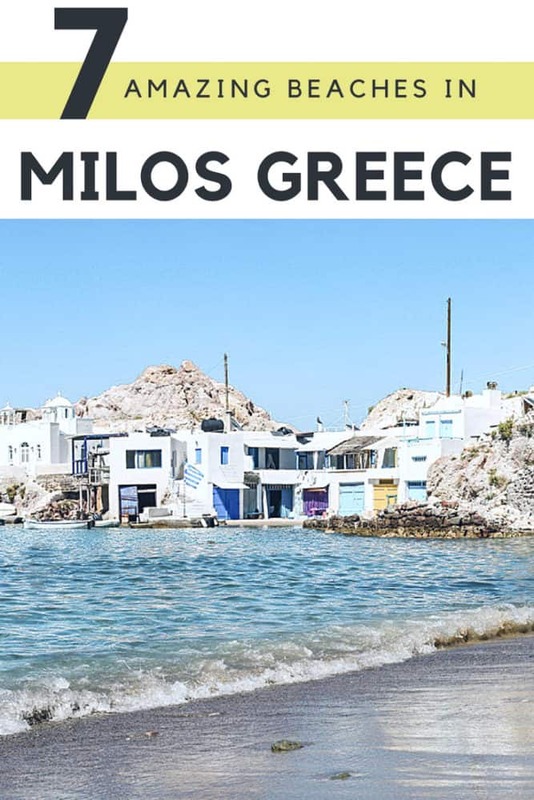 Milos is a wonderful Greek island that has tradition flair and natural beauty and is worth adding to your Greece bucket list! 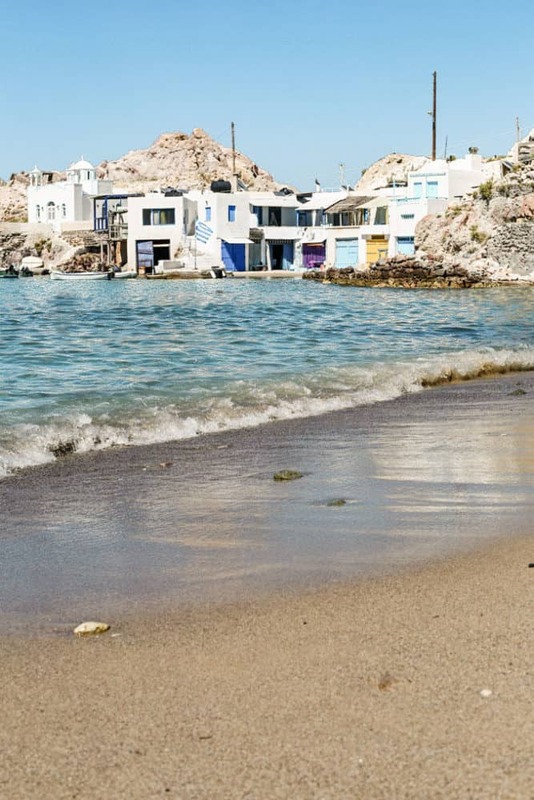 Kleftiko Beach is a total gem and just might be the best beach in Milos. Kleftiko is mainly accessible by boat, though there is a very tricky way to get there via foot (see How to Get to Kleftiko Beach on Foot). 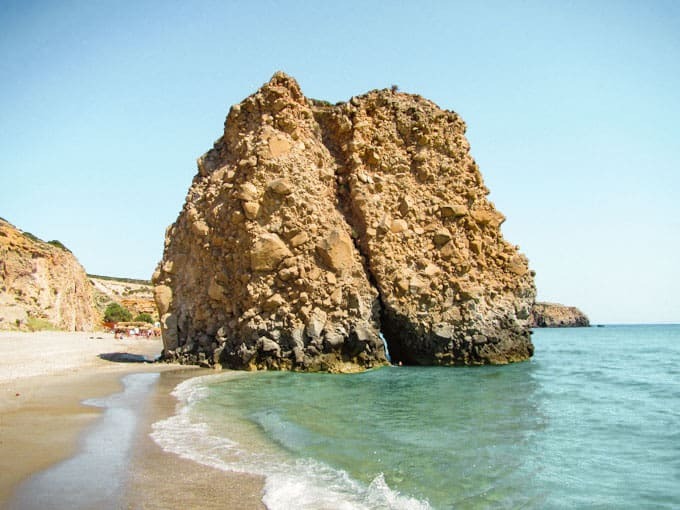 This beautiful beach has no sand but is full of plenty of smooth patches of rock that you can sit on and various rock formations that you can admire and photograph. 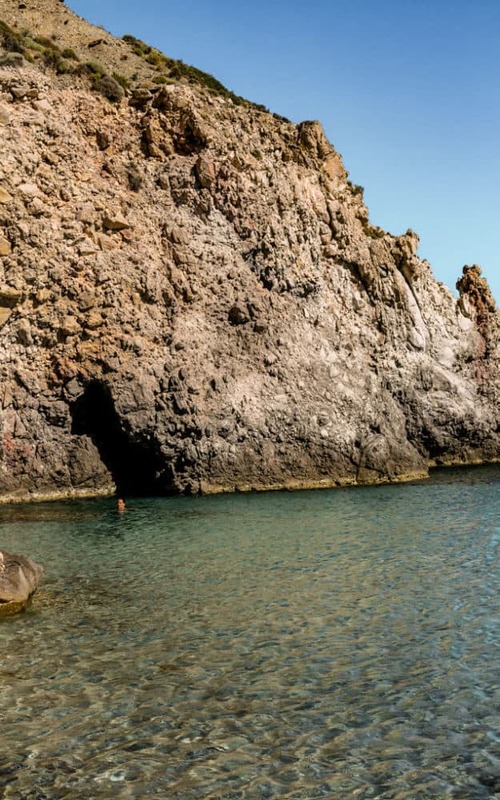 Swim from cave to cave, sunbathe or jump off the mini cliffs. Make sure you bring your camera, snorkel gear, food and water! There are no facilities. 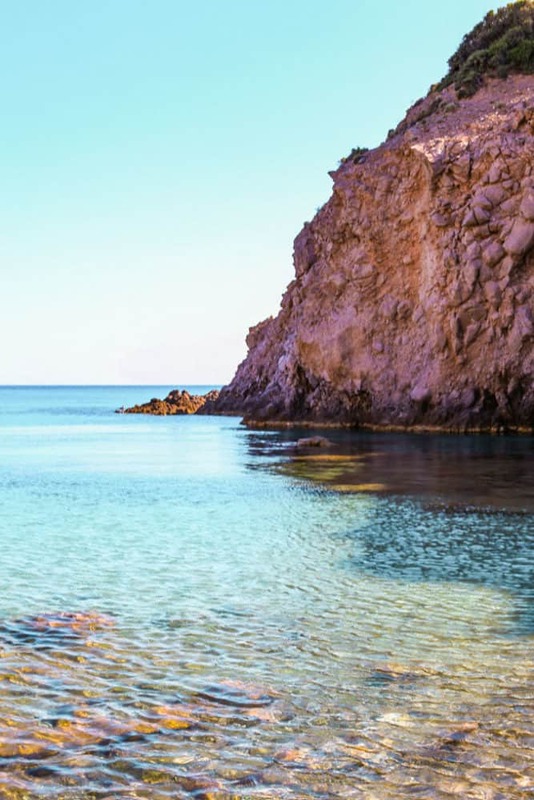 One of the prettiest Milos beaches is Tsigrado Beach. This beach is accessibly by car but come in shape and ready to descend and ascend a ladder. 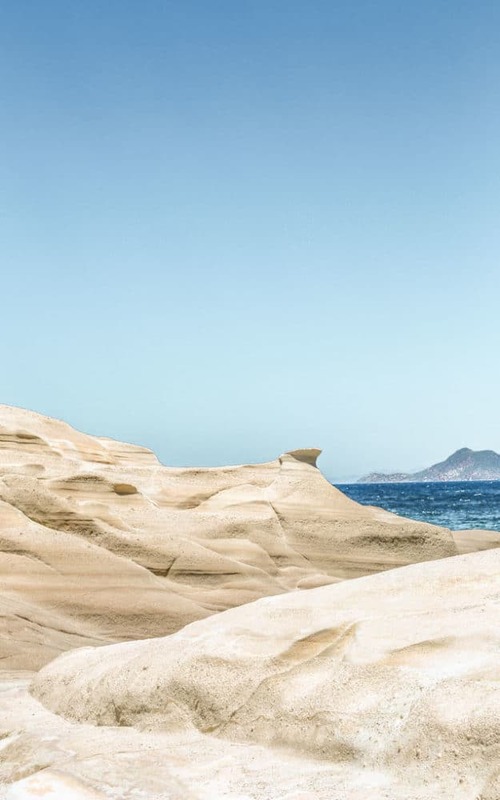 The only way to the actual beach is via said ladder and a steep incline (don’t worry, there’s a rope you can hold on to) – those afraid of heights should come prepared. Before you trek down, make sure you snap some photos of the beach from the top – the emerald and cobalt waters are worthy of at least a few photographs. Tsigrado has a patch of sand that is adequate, but it is a small beach so beware that it will get crowded mid-day. Come early or be prepared to share. Bring food and water – no facilities here either. 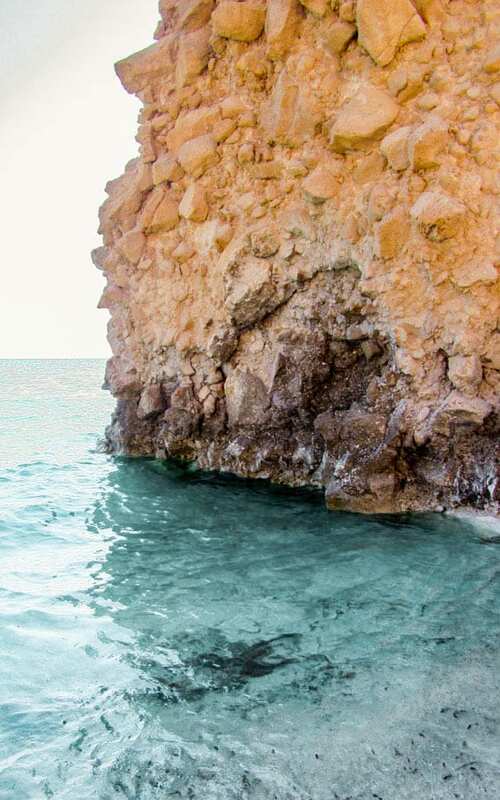 Rumored to be a hiding place for pirates long ago, Sarakiniko is probably the most unique beach on the entire island. 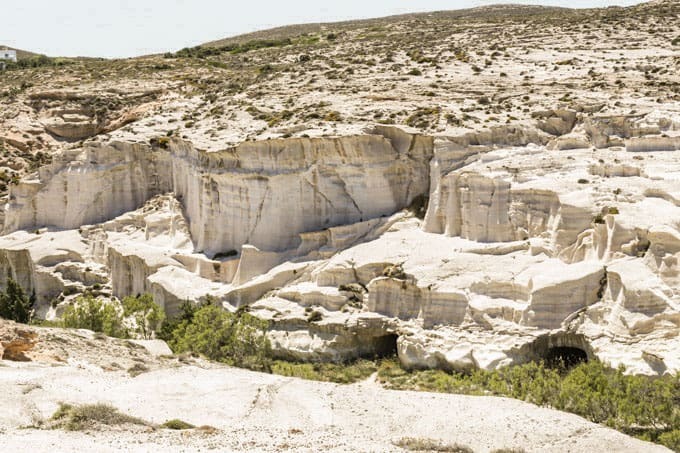 A spectacular display of white sheets and slabs of rock with an abundance of caves breaking up the monotony, this beach is worth at least a day trip. Park at the bottom of the hill and walk up the wide trail. 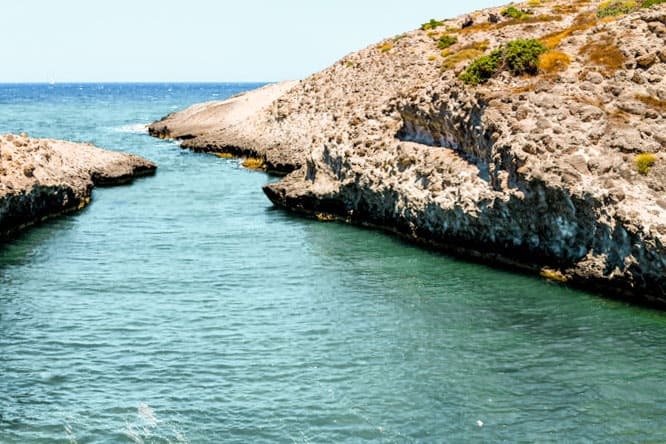 Wrap around to the left for a small sandy area with shallow waters or stroll throughout the rocks for a truly one-of-a-kind experience. The caves themselves are worth a peek but watch where you step as beach visitors tend to use the caves as facilities. 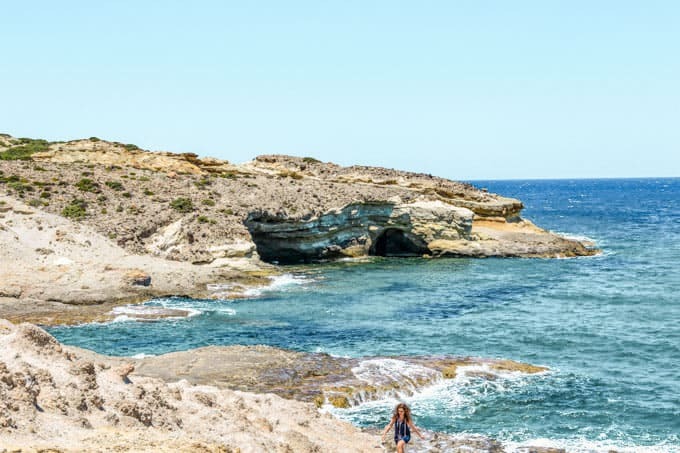 Firopotamos Beach can be spotted way up from the road. 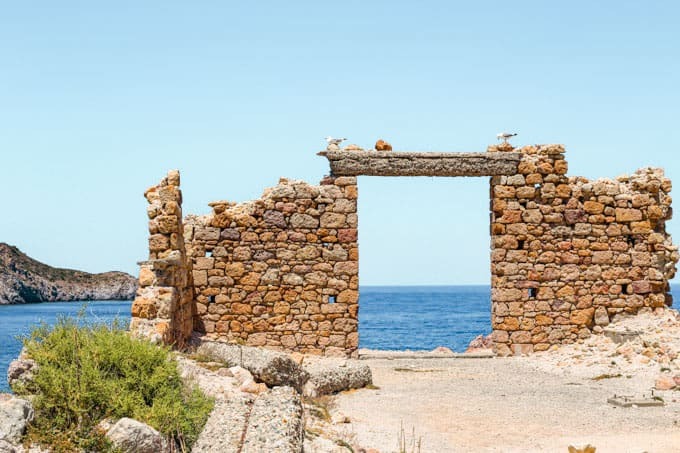 Drive further down until you reach the top of the town – walk over to the ruins and the cliff for a beautiful view and then drop down to the beach. This beach gets an A+ for plenty of places to sunbathe. The sand does have some stones so it isn’t the smoothest but you’re here for the turquoise blue water. Emerald and cobalt create a glassy like bottom. There is a small facility here and a food truck of sorts where you can purchase drinks. Obviously, cash only. 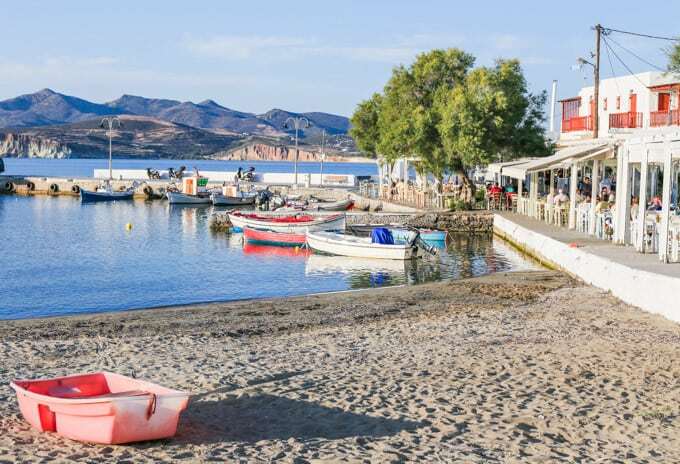 Firiplaka is the best beach in terms of size and facilities. The sandy beach itself is enormous, wrapping around to a cliff-like side. At the beginning of the beach, you will find a beach chair and umbrella area where you can rent a spot at a very reasonable rate (as of 2015, 6 euros/chair and umbrella). This is highly recommended as there is little by way of shade. There is a small food truck and they serve great coffee drinks. Park at the top (you will see other cars) and then make your way down the dirt path road towards the beach. Once you reach the bottom, you’ll think the path has ended but take a few steps on top of the stones sticking out of the water (to the left of the small house/building) and you will find a small path that you can easily jump to from the rocks. 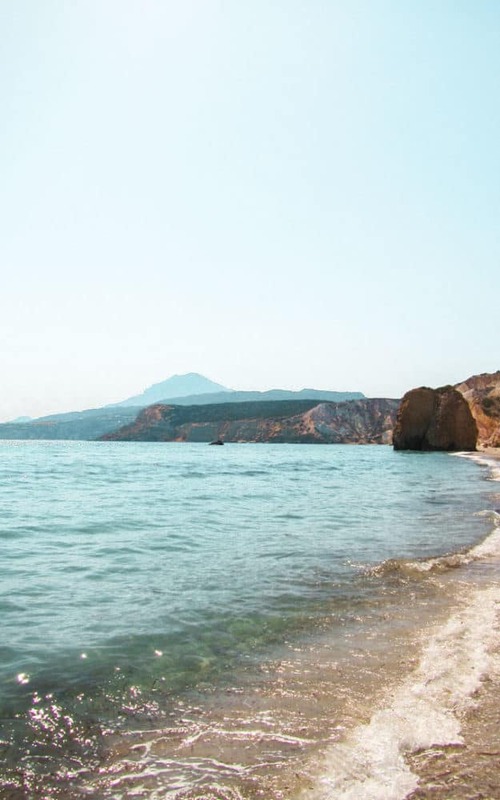 Pollonia Beach is a great beach for relaxing. 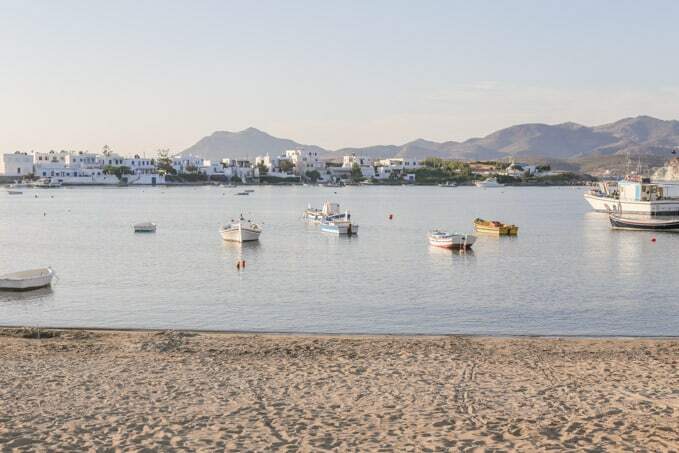 It is located within the town of Pollonia and is a well organized beach in terms of facilities and conveniencies. There are numerous hotels & restaurants that are located steps from the edge of the shore. Crystal clear waters are a highlight here as are the few trees for shade that dot the sandy shore. The water is shallow pretty far out so you can swim quite a ways before you may find yourself too far for comfort. The scenery is beautiful, small boats and a mountainous horizon dotting the landscape. 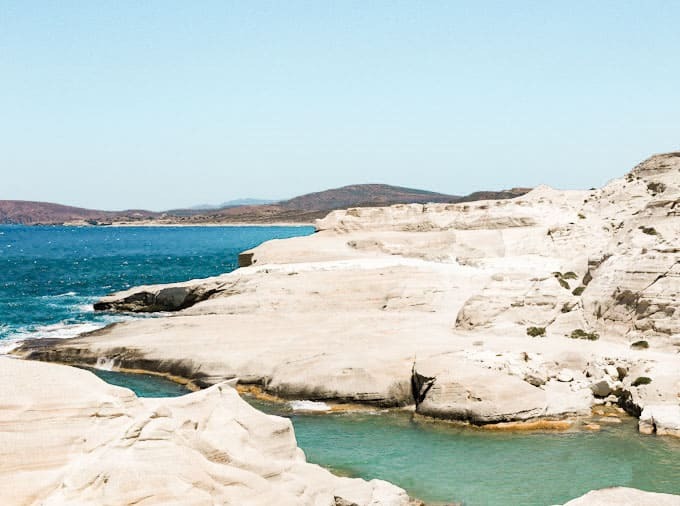 Papasfragas is a rocky beach that is perfect for exploration. The photo below depicts the actual beach area while the remaining photos represent the beach as a whole. 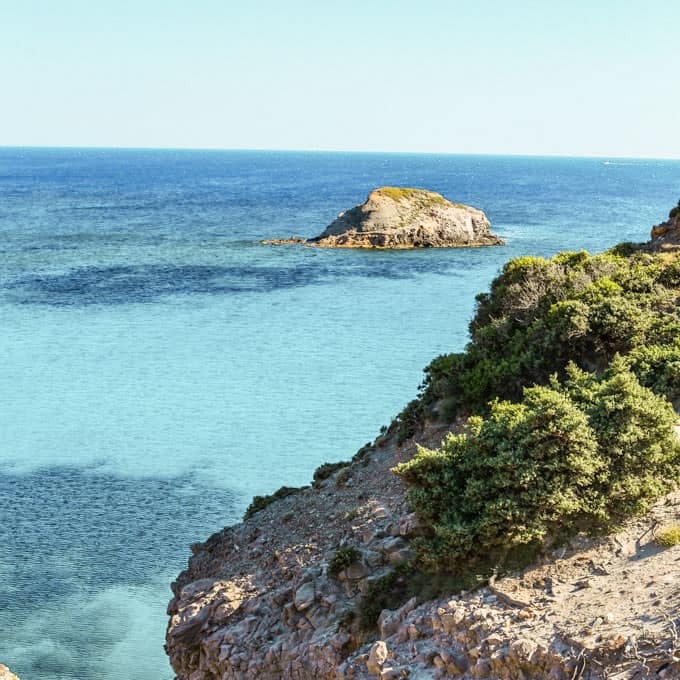 Beautiful shore with plenty of photo ops, Papasfragas is the ideal spot for walking around and exploring the fascinating landscape and terrain. 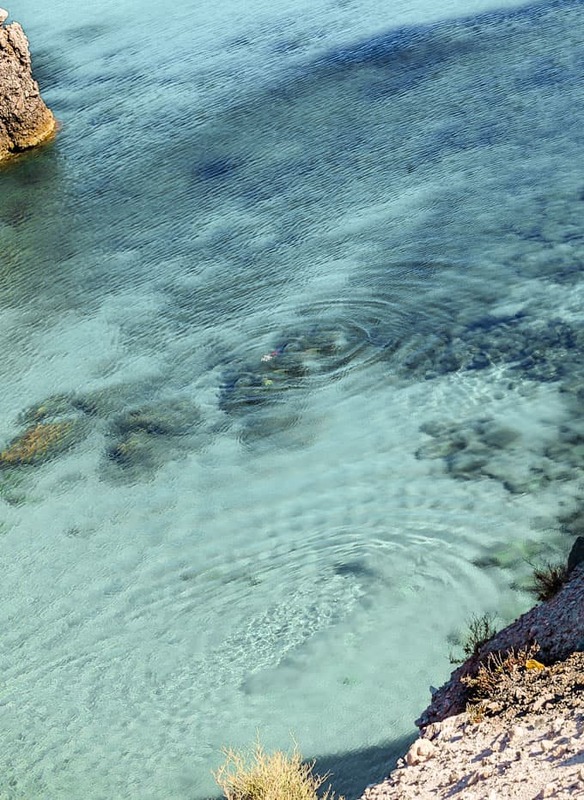 The water is clear but a bit tumultuous near the rocks – stay towards the edge of the shore when swimming. There are no facilities here. Wow! 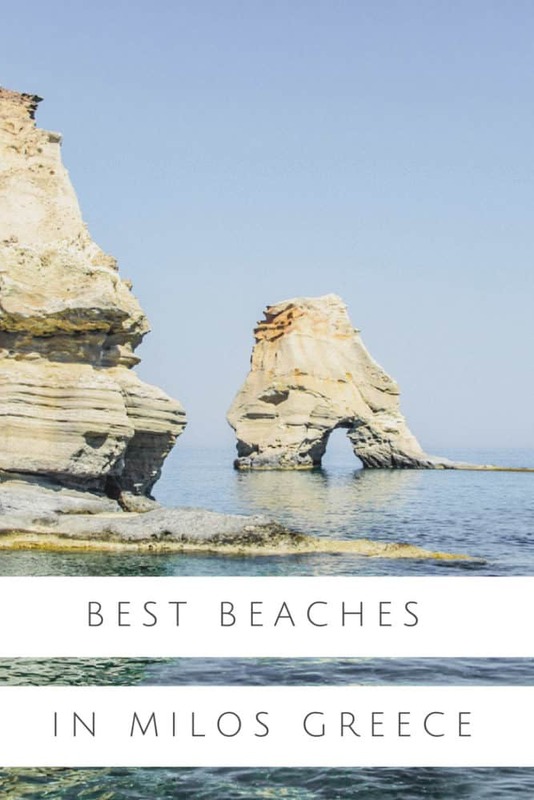 There definitely are a lot of stunning beaches! I want to pin every picture! Adore these marine shades! Great photos! Gorgeous shots!! 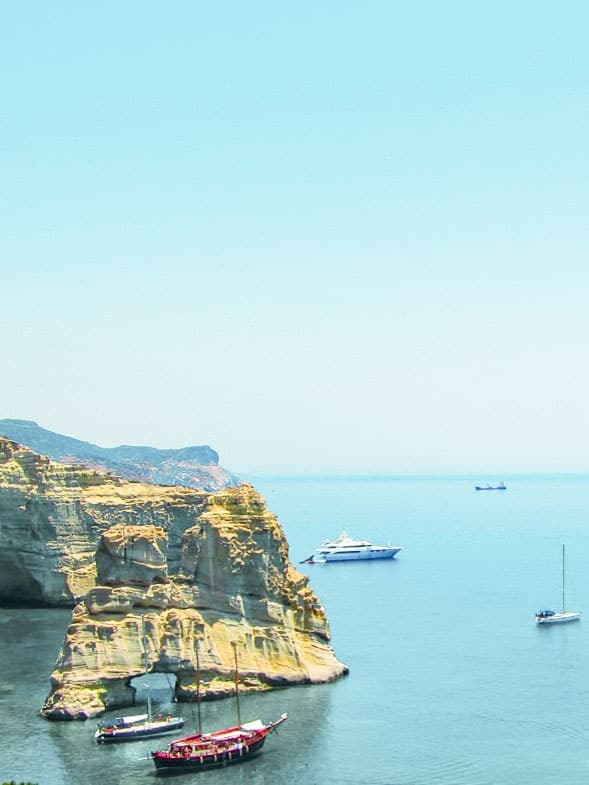 I’m heading to Greece this summer and hope to make it here! Yesssss I can’t wait to hear about all the islands you end up going to! So beautiful! I could live there! Incredible photos of an incredible Island! Me too! I dream of returning someday! I loved this! Such beautiful photos! I would love to travel there one day! I hope you get the chance to! It’s amazing! 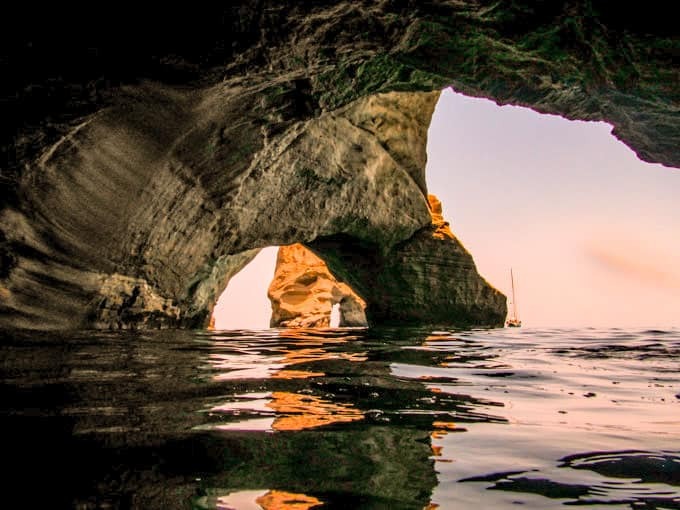 Milos is a beautiful volcanic island with many hidden gems. You shot beautiful picts! Aboard a sailing yacht is just awesome!